This year we are excited to have a few donations that we feel would benefit Susan G. Komen and Batting for Betty in a auction setting. All proceeds go to Komen. Winner will be able to donate the winning bid directly to the Batting for Betty Passionately Pink Team Page. These shoes, were generously donated by Danny Wood and were worn by him during the US and Overseas NKOTBSB Tour while on stage. Both shoes have been signed by Danny Wood himself. 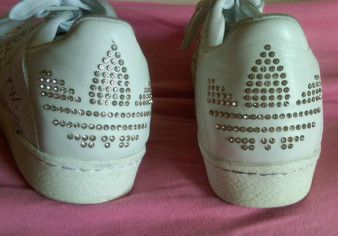 They are Adidas, size 10 1/2 shoes. Blinged New York Yankee Autographed Hat; ended on September 15th, 2012 See what it sold for! Click Here! Blinged New York Yankee Autographed Hat; ended on September 29th, 2012 See what it sold for! Click Here!